Sprint has formally introduced the HTC EVO Design 4G and is set to release the fifth member of the EVO family on October 23 for the wallet friendly price of $99.99 with a two-year agreement or qualified upgrade. It has been almost a month since the first press photo of the HTC EVO Design 4G was revealed. The Android Gingerbread device sports a 4-inch qHD display and is powered by a single-core 1.2GHz processor. On top of the Android platform of course is HTC’s Sense user interface. The back of the handset houses a 5 megapixel camera that can record video in 720p HD while a 1.3 megapixel shooter is perched on the front. The EVO Design 4G was once known as the HTC Kingdom and was rumored to be called the Hero S for a while. Since this smartphone is an exclusive to Sprint, 4G speeds will be provided courtesy of their WiMax network. It is also the first handset bearing the EVO moniker to have global roaming capabilities. Given its specs the EVO Design 4G seems to be a mid-range alternative to the HTC EVO 3D and some other non-EVO devices such as the Samsung Epic 4G Touch and the Motorola PHOTON 4G. For only $99.99 the HTC EVO Design 4G should be a solid choice if signing two years of your life away isn’t too much of a problem. The price is with a new two-year activation or a qualified two-year upgrade and after a $50 mail-in-rebate. Is anybody going to pick up the EVO Design 4G? qHD on a 4" screen sounds great, but I think they're diluting the EVO brand with this mid-range offering. HTC should use soc from someone else- qaulcomm blows especially in the gpu department with it's weaka$$ adreno line. Well there was the EVO Shift before this, so mid-range was there before..
You're kinda comparing apples and oranges in price here. Sprint's pricing scheme: EVO 3D $200. EVO Design $100. Amazon's pricing: EVO 3D $100. EVO Design? Likely Free or $50. All things in context. Furthermore, I think the Design is perfect. Just the right size screen (I found the 3D way way too bulky, and most 4.3" screens bother me) a processor that's plenty fast (dual-core really doesn't add to the speed any) and if it is compatible with ICS, there's really nothing else I'm looking for in a phone. It would be disappointing if a phone announced just after ICS was announced won't get it. My Evo 3d is especially bulky since I have a case with a kickstand on it. I was irritated that it didn't come with one like the Evo. I am also irritated that it doesn't have an HDMI out. I didn't get the S2 because it took longer to come out and Samsung has been awful about updates. If your irritated about your phone, why do you have it? Sounds like you complaining just to complain. it does have HDMI out you just have to have a MHL converter. Only problem with this phone is that it doesn't have a physical keyboard. If it did, then I'd be more interested in leaving my Evo Shift for this. phones like this are for non-techie girlfriends..
not sure that i want this one. I currently have the htc evo 4g and im upgrading in january but i don't know what phones sprint is going to have available. do any of you guys know what phones will sprint have by january running ice cream sandwich? i'd like to know too! the Galaxy Nexus might be on sprint by then, but besides that, it seems like sprint won't have anything special coming out anytime soon, like the other carriers do. they might even just ride on the profits of the epic 4g touch and iphone 4 and 4s for a little while (then again i dont know much about this stuff). i guess only time will tell... on another note: where the heck is the Evo 4G Plus?!?!?! I really hope sprint surprises us, because i want to upgrade already and i dont want to wait until next summer. and as much as I like the evo 3d, samsung galaxy sII i dont want to get them. i want something else. 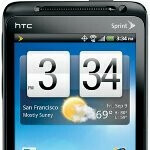 I've been searching for the past 6 months to see what would come for Sprint, specifically from HTC. The EVO 3D I'm not sold on, it's cool but 3D is a gimmick to me. I need a new phone now like badly even tho my upgrade time is April 1, I'm out of RAM and ROM and it's just getting annoying having to delete and kill apps. I'm not seeing anything apart from the SGS II from Sprint for now, I think what I'll do is just get an EVO 3D off contract, ride that out til something new comes along next summer. Especially seeing their announcements for LTe and that they aren't expanding their WiMAX. What I don't understand is how T Mobile got 2 Sensations and Sprint only has a gimmick version. Wish HTC came out with more high-end EVO smartphones to continue the legacy. Didn't realize this phone had a SIM card slot. Maybe that will make it worthwile for some.